Metalsmithing, Lapidary, Glass Fusing, Beading and more. 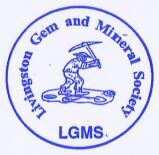 On Tuesday May 16th I joined the Livingston Gem and Mineral Society of Howell, Michigan. Their website has not been updated in a few years, but they do keep their facebook page up to date. They have a nice size membership of just over 140 members. They have classes in both rock cutting and silversmithing. One of the main reason I wanted to join is that they have a nice workshop for cutting stones that is for member use. I look forward to my membership and to cutting some stones!